How do I hand a door? What function should I order? What is the difference between single cylinder & double cylinder? How do I determine my backset? How do I prepare my door for a new lockset? How do I install my Baldwin Hardware? Locks are available in all the functions usually required in a house. These include Passage, Privacy, Dummy, and for deadbolts and keyed sideplate locks, Single Keyed and Double Keyed. Key-in-Lever and Knob locks are available with one function only, with a keyed cylinder on the outside and a turn-piece release on the inside. This function is used for doors where no locking is required. The knobs or levers freely operate the latch. Passage sets are commonly used on interior doors, and sometimes on an exterior door in conjunction with a separate deadbolt. Used on fixed (non-operating) doors and sometimes on closet doors. Sold as a pair, these handles do not operate, they stay in a fixed position, no latch is provided or normally needed. Dummy handles provide a firm grip where desired, and are used on the non-locking side of french doors to give balanced, matching appearance. Emtek dummy handles are surface mounted, no bore holes are required in the door. All mounting hardware is provided. The most popular configuration for deadbolt locks, a keyed cylinder is provided for the outside and a turn-piece is located on the inside. The lock may be locked or unlocked with a key from the outside. The turn-piece allows locking or unlocking without a key from the inside. In the U.S. there are two common backsets for residential locks, 2-3/8" and 2-3/4". 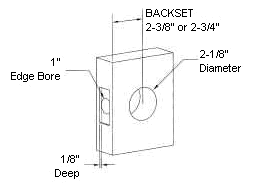 The backset is the distance from the edge of the door to the center of the 2-1/8" bore hole. We will pack your locks with a 2-3/8" or 2-3/4" latch depending on which backset you specify. Dummy sets have no latch and are surface mounted so you can install a dummy set wherever you choose on the door. Emtek locks fit into a standard American style tubular door prep. If you are replacing existing locks then your door preps will most likely be correct for Emtek locks. Just determine the backset and you're ready to order. If you're installing locks in new doors that do not have a door prep you can follow the instructions below. PASSAGE, PRIVACY, KEY-IN-KNOB OR LEVER, AND DEADBOLT LOCKS fit into the door prep shown above. Bore a 2-1/8" hole through the door. The center of this hole should be located 2-3/8" or 2-3/4" back from the edge of the door (this is the backset dimension). 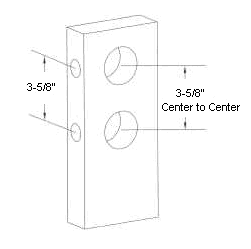 Bore a 1" hole in the edge of the door located on the centerline of the 2-1/8" hole. The latch will fit into the 1" hole. Chisel out a 1" by 2-1/4" rectangle on the edge of the door, 1/8" deep. The latch faceplate will sit in this recession. KEYED LOCKS WITH SIDEPLATES require two sets of holes with a center-to-center distance of 3-5/8" between the two sets of holes. Dummy sets require no door prep. Dummy handles are surface mounted and my be located anywhere on the door you choose, but they are usually located to match the appearance of nearby operating locks. For information on installing Estate products, call the Baldwin Customer Services Department toll-free at 1-800-566-1986. Consumer Service Representatives are available to assist you every day between 7 a.m. and midnight Eastern time. All of the instruction documents are in Adobe Acrobat Reader format (pdf). If you do not have this program, click the icon to download the program free of charge.